Sept. 13, 2017 | Sept. 13, 2017 | Krishna Nalleballe, M.D., has joined the University of Arkansas for Medical Sciences (UAMS) as a stroke neurologist, providing comprehensive stroke care from the initial emergency contact to outpatient recovery care. In addition, Nalleballe will serve as a consulting neurologist with the Arkansas Stroke Assistance through Virtual Emergency Support (AR SAVES) network, which is hosted at UAMS. In this role, Nalleballe will assist doctors across the state via two-way video as they make potentially life-altering treatment decisions in the first few hours after a stroke. 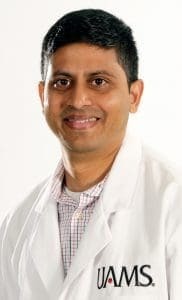 He will also serve as an assistant professor in the Department of Neurology in the College of Medicine, conducting research and training future neurology doctors. Nalleballe will see emergency stroke patients who come to the UAMS Medical Center and continue to work with patients as they recover through the Stroke Services Clinic. Nalleballe comes to UAMS from Jamaica Hospital Medical Center in New York, where he was a neurologist and director of neurological research, and the New York Institute of Technology College of Osteopathic Medicine in Old Westbury, New York, where he was an assistant professor. Previously, he also served as an assistant professor in the Department of Neurology at the Albert Einstein School of Medicine in Bronx, New York. Nalleballe earned his medical degree from Osmania Medical College in Hyderabad, India. He completed internships at Osmania General and allied hospitals in India and North Shore Medical Center in Salem, Massachusetts. He was chief resident during his neurology residency at Temple University School of Medicine in Philadelphia and completed a vascular neurology fellowship at the Albert Einstein School of Medicine. UAMS is nationally certified by The Joint Commission as an Advanced Primary Stroke Center. UAMS has the only comprehensive stroke treatment team in Arkansas, with one of the few stroke neurologists in the state. The stroke team includes Nalleballe, interventional neuroradiologists, who provide catheter-based treatments of the brain, vascular neurosurgeons, and a neurocritical care specialist. The AR SAVES telestroke program links 53 hospitals throughout the state. AR SAVES enables a stroke neurologist to view brain images from a distant location. Neurologists can act quickly to interact with and examine a patient to determine whether the stroke is the type that can be treated by a special clot-busting drug that must be administered within the first few hours from stroke onset.